As a good parent you attend all the informational meetings at your student’s high school and get acquainted with all the special steps that will finally lead to your child attending university. You might even visit some colleges and check them out. But at one point you will just freeze… That’s when you have reached the “Cost of Attendance” part online or during a college presentation. As my older son is preparing to going back to university and all of us are getting ready for our last trip this summer to drop him off in northern California, I realize another summer has come to an end! It’s ‘Back to School‘ for so many children in California! While my eight year old still has a few weeks left to enjoy the beaches before his new school year starts, many California school districts are starting their new school year already this week. For many students a new year just means moving up to a higher grade, but for some of the youngest ones it means starting a completely new stage of life as they prepare for their first day of elementary school! 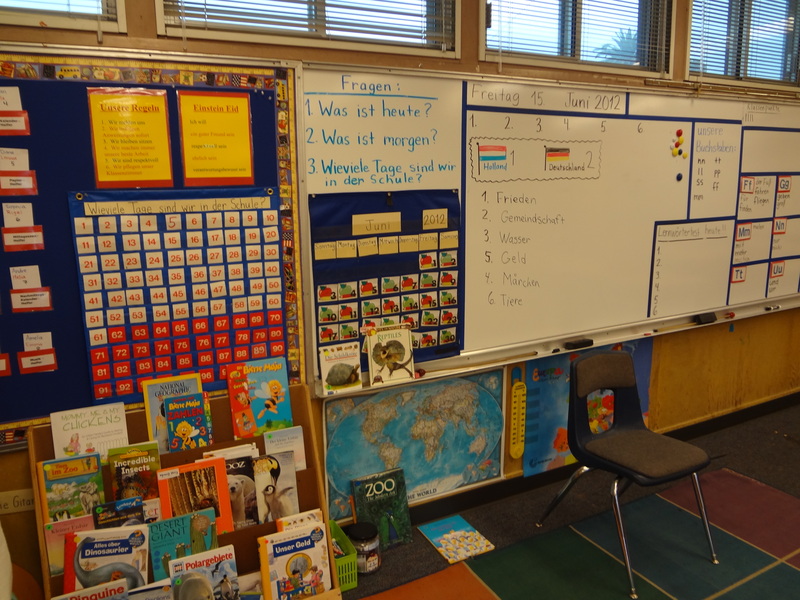 This made us take a look at some of the German preschools & Kindergarten available in California. Last year we had introduced BAKS, the Bay Area Kinderstube with an interview of its director Sybille Cohen. It is a full immersion German language preschool that started out as a parent initiative in 1994 and became a private preschool in 1997. BAKS is a very charming pre-school in a quiet neighborhood in Albany right next to Berkeley. It is the perfect place to send your little ones to slowly ease them into a new way of life – the life of a student. The school feels like a home away from home with an inviting playground and yard where the children grow plants and have a lot of space to run around. At BAKS children enjoy a lot of different activities while ‘living the German language’ through reading, singing, doing arts, nature explorations and also cooking and baking together with the teachers. Since last year the children are even offered martial art lessons and yoga. BAKS is for children 2.5 to 5 years old. 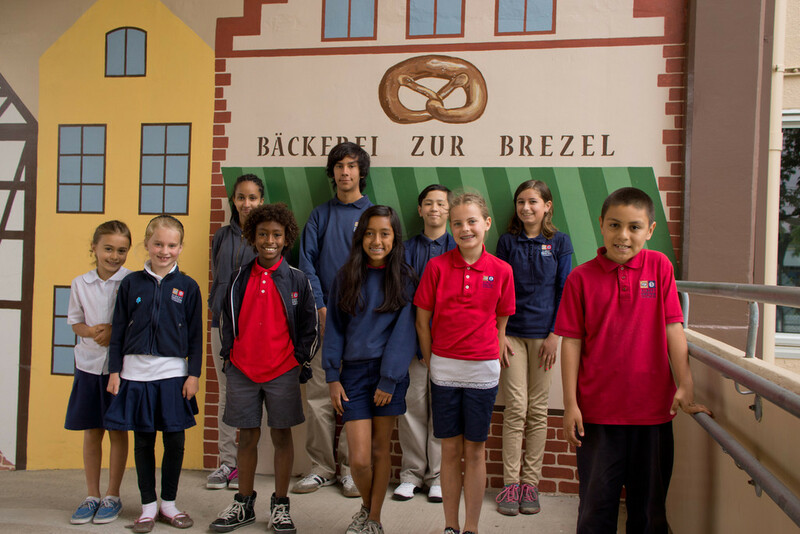 Many children who have started at BAKS continue their German school education at the Berkeley campus of the GISSV (German International Schools of Silicon Valley). BAKS has grown very popular over the last few years and it is advisable to put your name on the waiting list early on. One is KinderHaus right in San Francisco. Similar to BAKS it is a smaller preschool but is run as a parent co-op. KinderHaus, a German international preschool, started out in 2005 and is located in the heart of the Mission District. The school follows the Piaget’s approach to childhood eduction. “This developmentally appropriate program is based on children’s intellectual, social, and physical needs and designed to encourage child-initiated learning activities within a supportive environment.” (Kinderhaus) . To learn more about KinderHaus visit them at their next Open House on Saturday October 15th from 10:00am – 12:00pm. The other two preschools are part of the two international schools, which are both located in Silicon Valley. One in Mountain View , the other in Menlo Park. 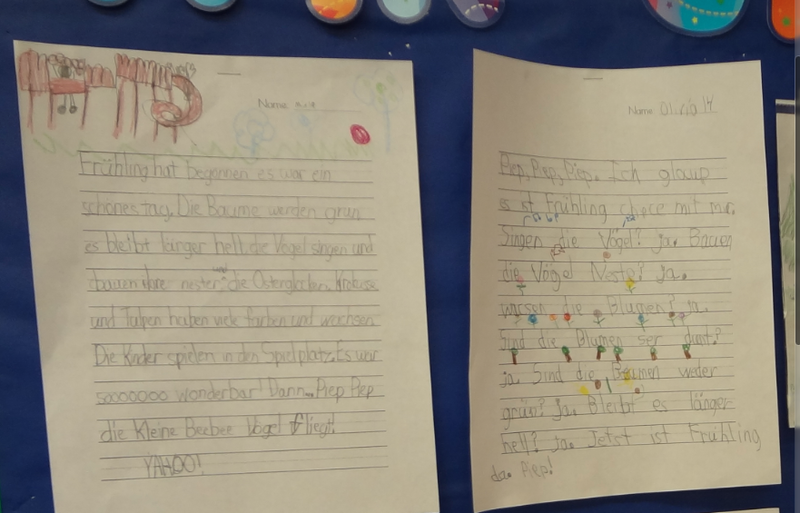 Going south we find two preschools with German language immersion programs. Tivoli Rainbow Garden Preschool is a small quaint preschool with a very central location in L.A. The school has a daily program for up to 12 children in a mixed age group from 2 1/2 years old to Kindergarten age. Kigala Preschool in Santa Monica on the other hand is a much bigger preschool in comparison offering children not only German language immersion but also Spanish immersion programs. Parents can enroll their potty trained toddlers in morning, afternoon, and also full day sessions. 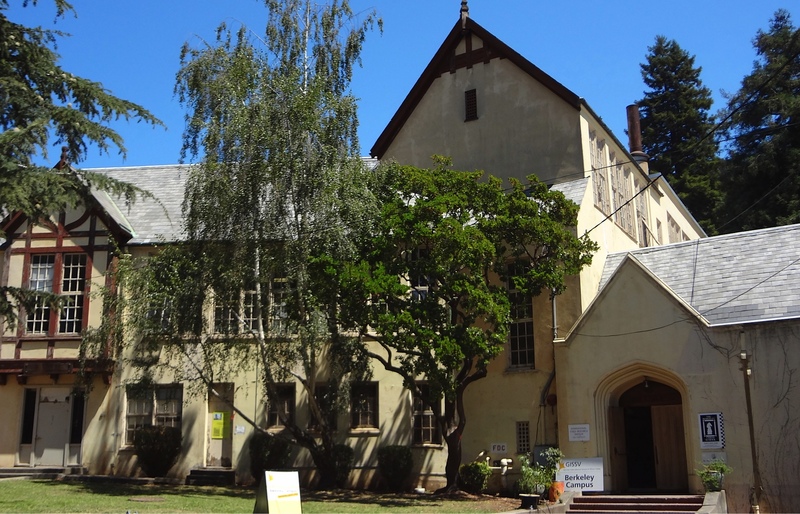 As we move more south along the coast it seems German schools have become more scarce. Orange County for example has no dedicated German language immersion preschools or elementary schools despite a quite extensive local German community. 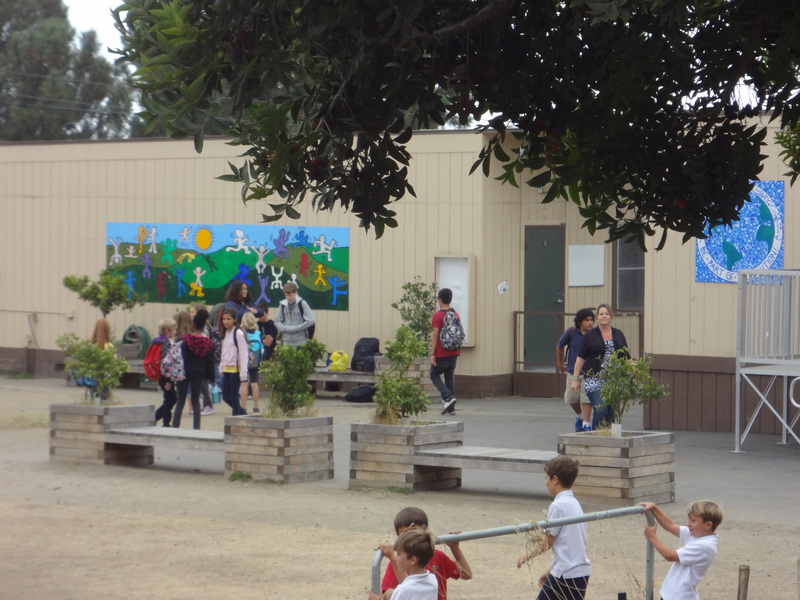 The closest one with some German infused education is Anneliese School with its three campuses in Laguna Beach. 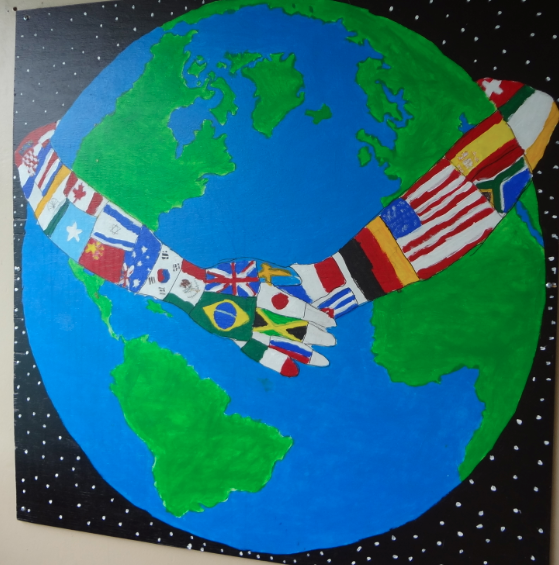 Here children are exposed to a variety of languages from preschool on and receive formalized instruction in both, German and Spanish, from Kindergarten through sixth grade. A fairly new school in Orange County that we just have learned about is OCI Academy (Orange County International Academy) in Ladera Ranch, which offers language immersion programs for children ages 2-9 in six different languages including German. San Diego as our last destination on our search for German preschools has one full German language immersion preschool called Die Rasselbande. Founded in 2003 with only 12 children the school has grown into serving over 80 students to date. There are five preschool classes grouped by age and one mixed age class to choose from. 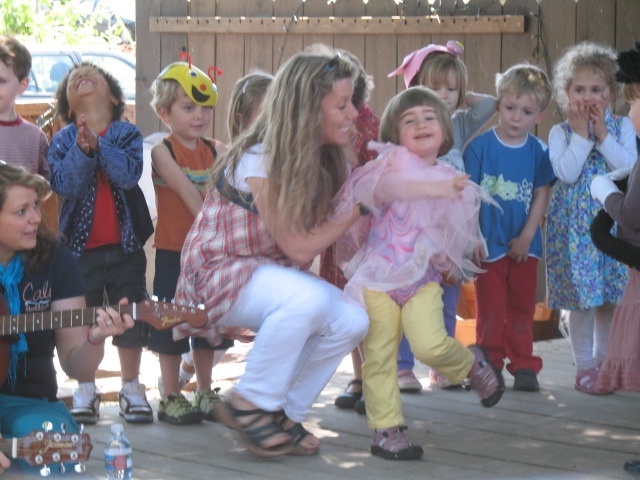 The school follows a play-based program that nurtures the whole child. The language during school operation (9am-2pm) is exclusively German. 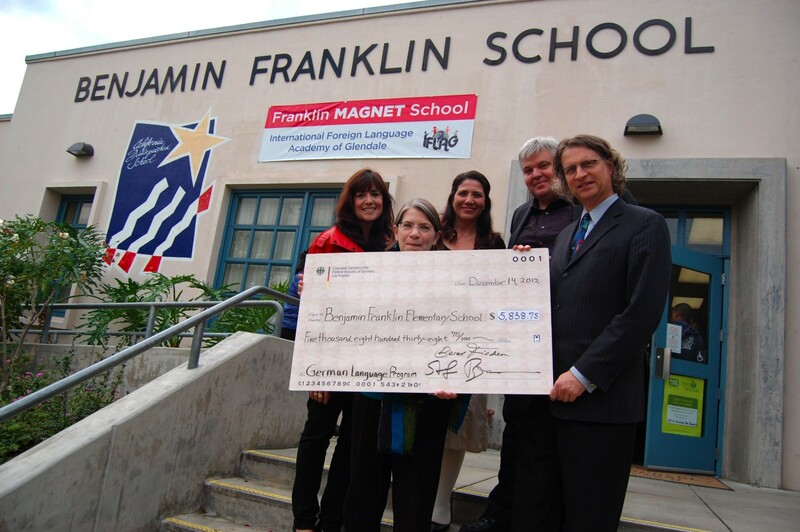 Many children who went through the program of ‘Die Rasselbande’ continue their German school education at the Albert Einstein Academies, a German immersion elementary school (K-8) that CaliforniaGermans had portrayed in July. A Geman tradition is to celebrate your child’s first day of elementary school with a ‘Schultüte’ . This day marks the transition from playful preschool days into the structured life of elementary school education and beyond. 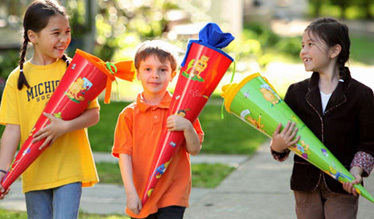 CaliforniaGermans wants to celebrate this special day with you and teamed up with KinderCone, the first company to introduce this German tradition to America through a line of custom designed Schultüten called KinderCones. Check out CaliforniaGermans Facebook page to find out how you can win one of three KinderCone First Grade Editions sponsored by KinderCone.